Recently, film critics were musing about the impact that the Academy Award-winning films have had through the years. The conversation continued questioning the influence that major Hollywood films have had on society through the years. The question arises: Does Hollywood simply follow trends or does it sometimes reflect the cutting-edge of our society in terms of morality and social norms? A look back on the past century sheds some light on the films and their impact through the years. The first award for Best Picture went to Wings in 1927. This was the only silent film winner until The Artist won in 2011. There were really only a handful of outstanding movies that won Best Picture before 1934, and they reflected the current trends of the day. Since westerns were very popular in the early days of film, Cimarron won the Best Picture award in 1930. In 1934, a screwball comedy won. It Happened One Night also swept the major awards, giving Clark Gable and Claudette Colbert both Best Actor and Actress Oscars, respectively. You Can’t Take it With You, winner in ’38, gave Frank Capra another Oscar win. This picture, quaint and dated in some ways, also takes a serious look at the notion that success in American life depends on the amount of money you make and how hard you work. We are still grappling with this notion regarding the lifestyle and values of the American middle-class. Gone with the Wind was a blockbuster in all respects. Clark Gable, already a star, established himself as an icon in the role of Rhett Butler. The cinematic accomplishments of David O Selznick are still celebrated with this landmark production. 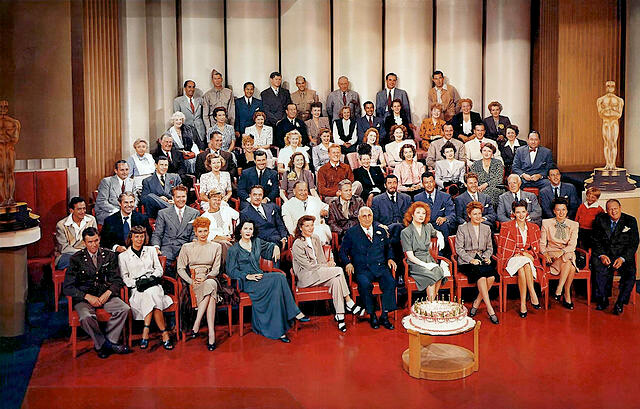 Many critics argue that 1939 produced some of Hollywood’s greatest films. It was a landmark year, and there were other years with similar lists of films all deserving of the Oscar. During the 1940’s, Rebecca won the Oscar for Alfred Hitchcock (the only one of his many films that won Best Picture, although he never won a Best Director Award!). Casablanca, winner in 1943, was probably the most famous film of the forties to win the Best Picture award. Yet, The Lost Weekend was also a landmark film in many ways. It addressed the problems of alcoholism and, despite its dark subject, it managed to win the Best Picture award for 1945. America was changing, with many darker films in the film noir genre being made in this time period. In the book 6 Degrees of Film, the reasons for the rise of Film Noir, with all of its darker connotations, are discussed in detail. The Best Years of our Lives won Best Picture in 1946. It dealt openly with the many problems that veterans faced after coming home from World War II. In Gentlemen’s Agreement, the winner in 1947, another tough subject was acknowledged. The subject was anti-Semitism, and few movies before or since dealt with the problem as successfully as this film. Hamlet, Best Picture of 1948, was a chance for Hollywood to give a nod to not only the Bard himself, but one of the most revered cross-over actors-one who came from the stage and successfully transitioned into Hollywood-Sir Laurence Olivier. In 1949, All the Kings Men, although not as well known outside of political circles, remains a respected look at the corruption that political power may bring. All About Eve, Best Picture in 1950, is definitely one of Bette Davis’s most well-known roles. The film has endured with movie buffs and Davis fans over the years. In 1951, a landmark film won Best Picture-An American in Paris. Gene Kelly created many timeless dance numbers and the film endures as a monument to his skill and unsurpassed technique regarding the art of the dance. In 1953, From Here to Eternity won Best Picture. Again, Hollywood tackled tough subjects confronting society. Described as a “realistic portrait of the U.S. military”, this film was one of the raciest of its generation, as it included the famous scene with Burt Lancaster and Deborah Kerr making love on the beach. In 1954, On the Waterfront won Best Picture. This film broke ground and is described as a “tough, uncompromising look at corruption on the New York waterfront”. It also showcased the incredible talents of a young Marlon Brando. Another stand-out film of the fifties was The Bridge on the River Kwai. Winning in 1957, this film also took a hard look at some of the harsh conditions that prisoners of war endured during World War II. In 1959, Ben-Hur, one of the classic action-adventure films, won Best Picture. The year before, a light musical, Gigi, won Best Picture. These two films ushered out the fifties. The studios were in decline and television was on the rise. Many aspects of our culture would change in the next ten years, and it was reflected in the types of films Americans went to the movies to see. The winner for Best Picture in 1960 had a controversial subject. The Apartment, dealt with an executive who kept an apartment on the side for his extra-marital affairs. In 1961, the winner was West Side Story, which told the story of a modern day Romeo and Juliet, a pair of star-crossed lovers living on the West Side of New York City. Another Best Picture winner was Lawrence of Arabia in 1962. The film lives on with so many great performances and the hauntingly beautiful music that surrounded this epic masterpiece. In 1964, the award for Best Picture went to a film with much lighter content. My Fair Lady acknowledged the talents of Rex Harrison and the memorable music surrounding the hit play. By 1965, the musical was on the decline. Yet through it all the beautiful scenery and memorable music from The Sound of Music gave the film the necessary ingredients to win the Best Picture award that year. A Man for all Seasons, another play adapted for the screen, won in 1966. And in 1967, the acknowledgment of the changing mores and societal norms were examined in the Best Picture winner, In the Heat of the Night. By 1969, the American psyche was ready to give the award to a film about a male prostitute. Midnight Cowboy won Best Picture in 1969. Yet in 1970, another movie about war and the personalities of the men fighting wars was examined. Patton was awarded Best Picture. The French Connection, a landmark film which centers around one of the most harrowing car chases ever filmed, won Best Picture in 1971. But 1972 saw a sea-change in film-making when Francis Ford Coppola’s masterpiece, The Godfather, won Best Picture. The art of cinematography plus acting and directing were melded to produce one of the acknowledged great films of all time. In 1973, The Sting won Best Picture, which gave a nod to one of the greatest duos in screen history-Robert Redford and Paul Newman. The Best Picture award went to The Godfather Part II in 1974. And in 1975, Hollywood insiders and moviegoers were excited by something that had not occurred since It Happened One Night in 1934. One flew over the Cuckoo’s Nest took all three major awards-Best Actor/Picture & Actress. The seventies contained so many landmark films and introduced us to many screen greats that are still with us. 6 Degrees of Film chronicles the cutting-edge technology that was spawned during the making of one of the most celebrated films of the past quarter century: Star Wars. Although it didn’t win, it was nominated for Best Picture in 1976. The movie world also buzzed in 1976 with the arrival of Sylvester Stallone’s Rocky, which won Best Picture that year. And in 1977, Woody Allen became officially “mainstream” with his Best Picture winner Annie Hall. Another film which introduced us to one of the legends of the screen was The Deer Hunter, starring Robert De Niro, Christopher Walken and a very young Meryl Streep. It won Best Picture in 1978. And Platoon, which brought Oliver Stone onto the public stage, was another hard look at the realities of war. It won in 1986. In 1988, Rain Man won Best Picture. Looking at the Best Picture list, Rain Man easily qualifies as one of the best films made during the 80’s. And in 1989, Driving Miss Daisy won Best Picture. Here is another look reassessing the relationships African-Americans have had in the South over the past fifty years. Dances with Wolves won Best Picture in 1990. Although not a memorable winner, it was an acknowledgment of Kevin Costner’s box office appeal at the time. In 1991, one of the more significant films of the past two decades won Best Picture. The Silence of the Lambs was one of the first thriller/horror pictures to win. And it established the unforgettable character of Hannibal Lecter, a villain explored in countless knock-off films since. Unforgiven won in 1992. The Academy acknowledge the body of work of Clint Eastwood, and in doing so, gave the Oscar to a Western for the first time since Cimarron won in the 1930’s. Schindler’s List, which won in 1993, acknowledged the genius of Stephen Spielberg. And in 1994, Forrest Gump honored a new phenomenon. The genius of Industrial Light & Magic, George Lucas’s special effects studio, which created the memorable effects in Forrest Gump. Braveheart, the 1995 Best Picture winner, recognized the box office appeal of Mel Gibson. But the studios and film world were all taken aback in 1997, with the success of Titanic. The Best Picture winner won in so many different categories and broke all attendance records. Even former Blockbuster films paled with the success of this landmark film James Cameron, the director, was suddenly acknowledged as a leading power broker in Hollywood. In the last ten to fifteen years, we have had few groundbreaking films winning the Best Picture award. Gladiator in 2000 was a blockbuster. And Lord of the Rings: The Return of the King, the Best Picture winner in 2003 is on the list of highest grossing films of all time. (Titanic and Gone with the Wind are also on the list). With so many changes in the industry, the emergence of high-tech computers, digital imaging and a new era in special effects cinematography, there is an acknowledgment of the Oscars as a sometimes quaint and old-fashioned kind of award. However, there are still trends emerging in the categories we see that include the Best Picture of the Year. In 2007, No Country for Old Men acknowledged a new kind of nihilism and realistic landscape that the viewing audiences were seeing in mainstream cinema. And the winner in 2008, Slumdog Millionaire, has probably been one of the most significant Best Picture award winners in the last ten years. Namely, because it reflects the trends in Global Marketing for films. No longer are audiences watching films that play for the isolated market that was found in the United States perhaps fifty years ago. The timeless classics, the films that have endured and stayed with the public psyche, are those films that transcend the borders of our country. Screwball comedies such as It Happened One Night, classic adventure films such as Casablanca, captured the world’s imagination. An American in Paris appeals to art and dance lovers worldwide. Lawrence of Arabia dealt with problems in world peace that have plagued nations for over a century. The Godfather speaks in a cinematic language that moviegoers understand through the ages. Titanic tells a love story that appeals to young and old alike. And Slumdog Millionaire does the same. These are the timeless winners in the Best Picture category. The Academy doesn’t get the chance every year to nominate and honor timeless classics. They come along once in a generation. Time will tell which of the films nominated this year will still be relevant into the next century.